vSTAC Data nodes deliver storage resources that scale as nodes are “stacked” together in a Pivot3 virtual storage and compute vSTAC array. Each vSTAC Data node contributes resources dedicated to scale-out RAID so that IP SAN resources are created, protected and shared across the entire vSTAC Array. A vSTAC array contains from three to 12 nodes. vSTAC arrays may contain a mix of vSTAC Data and vSTAC Watch nodes. vSTAC Data nodes are stacked together to create a high availability iSCSI SAN. Storage components, network connections and even complete node failures can be sustained without affecting data availability. Storage can be logically and physically expanded while applications are running to meet the needs of the most demanding environments. New nodes contribute capacity, bandwidth, solid state, and RAID resources to the expanded vSTAC array. Advanced RAID techniques protect data against the most extreme conditions. 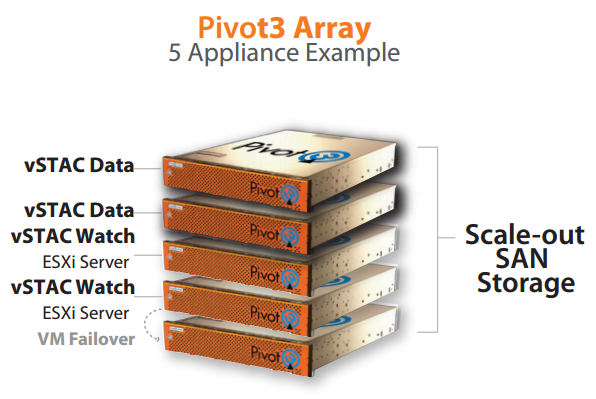 While conventional RAID systems protect up to two simultaneous drive failures, Pivot3 RAID 6x extends failure protection to five simultaneous disks or two drives and the loss of an entire node. A load-balanced appliance model reduces the upfront configuration time since configurations are dynamic and storage resources are applied as needed. There is no need to master complex SAN concepts since the vSTAC is based on familiar Ethernet and server standards. Each array may contain a mix of vSTAC Data, vSTAC Watch, HCI, Trend and VSS appliances.